The photo above says it all. 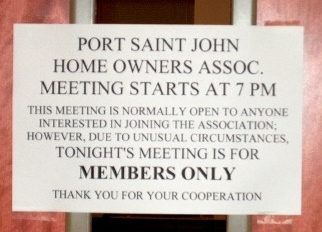 The PSJHOA decided to limit attendance at the meeting to members only. Peter Costello (a member in good standing according to Florida Statute Chapter 617.0601 paragraph 7) politely attempted to gain entrance but was denied entrance by Mrs. Dezendorf. Others arrived and tried to gain entry, but were also denied. Linda McKinney (a member in good standing according to Florida Statute Chapter 617.0601 paragraph 7) arrived late due to being at the County Commission Board meeting, and tried to gain entry, but the door was already locked and the sign posted. The name of this corporation shall be: Port Saint John Home Owners Association Inc., whose initial registered office is 260 Manth Ave. Port Saint John, Brevard County, Florida. We believe the PSJHOA is in violation of its own Articles of Incorporation as well as the Florida Law regarding membership. In anticipation that they will soon recognize their obligation to function in compliance with the law; the PSJ Bulletin will refrain from further comment until Sunday August 15, 2004. Because of Hurricane Charley the original deadline is extended to Saturday August 21st. We look forward to hearing from the PSJHOA. PSJ History/Bulletin Editor's Note: From what I understand all Brevard County Libraries have a policy in which if you haven't paid to rent the room, then all meetings of all organizations, clubs, associations, etc., are open to the general public and anyone who wishes to attend may walk right in and stay for the whole meeting. So this lock out broke several laws as well as Library policy. The librarians should have enforced Brevard County policy but several Library Advisory Board members were also involved in locking people out of the meeting. As Library Advisory Board members, they should have been well acquainted with the rules of meeting room use. So it looks to me as if they broke the rules intentionally and the library did nothing about it.